In a TV spectacle celebrating the Chinese New Year and seen by more than 640 million viewers, 540 Chinese-made robots danced to a song sung by a Chinese superstar and 29 neon-colored drones flew in unison overhead. To give a point of comparison, 115 million Americans watched the Super Bowl; 640 million viewers watched the Spring Festival Gala celebration of Chinese New Year. Another factoid: Intel just won a Guiness World Record for having 100 flying drones fly and show their colored lights in sync with an orchestra playing Beethoven’s Fifth Symphony, compared to 540 UBTECH Alpha1 robots performing synchronized dancing. 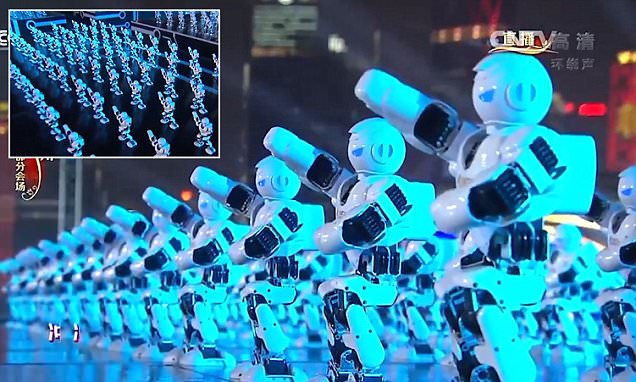 UBTECH used their Alpha1 robot for the CCTV Chinese New Year show. On their website they are showing their new Alpha2 – in English – in a revealing video. This Chinese New Year’s inclusion of robots and drones – and Japan’s focus on showcasing robots and robotics for their Olympics in 2020 – show the interest which translates into consumer demand. UBTECH and many other startups in China and elsewhere are focusing on taking advantage of that Asian interest in humanoid objects with products such as the Alpha robot and the SoftBank Pepper robot. In fact, Alpha is smaller than Pepper but they both interact using human speech and are geared to home and social use. Alpha, Buddy, Jibo and Pepper are all entering the marketplace this year and we will see how they fare after a few months of user experience. Certainly Alpha is a Chinese competitor to the success of Pepper.